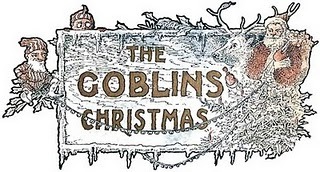 The above graphic comes from Elizabeth Anderson’s children’s tale, The_Goblins’ Christmas. It’s an odd little story that hasn’t gotten much attention since its initial publication in 1908 and I’m fixing that by providing you all with a direct link to the illustrated full text. Just be warned that some of the language used isn’t very politically correct and some children might find the eventual fate of the goblins upsetting. Speaking of stories, Charles Dickens’ A Christmas Carol greatly helped give Christmas its current focus on familial togetherness and generosity, as its celebration had previously been dwindling and focused more on drinking and wild partying (Wikipedia offers a brief-yet-informative look at Christmas before and after its “reformation”). However, it had one other interesting effect on the holiday: It forever linked ghosts and Christmas in England! Not only was Dickens soon forced to pen other ghost stories (both directly Christmas-related and standard spooky stories without a holiday theme), but it became customary to tell ghost stories at Christmastime. Don’t believe me? heck out the description in this audio drama collection of British ghost stories or the introduction of this excellent review of The Stone Tape (includes spoilers). Like A Christmas Carol, The Stone Tape had a lasting impact…on paranormal studies. Come to think of it, I wonder how much Dickens’ membership in The Ghost Club had to do with A Christmas Carol (or vice-versa). Oh look, someone decided to give the Pride and Prejudice and Zombies treatment to A Christmas Carol, how…unnecessary. What’s next, a zombie-filled version of Edison’s Conquest of Mars? On the plus side, It’s Beginning to Look a Lot Like Zombies isn’t nearly as obnoxious and its humorous carols are a great way to spice up a winter zombie walk. Or, if you prefer reading stories to sheet music, The Undead That Saved Christmas anthology should be more appealing. Both links give you free previews of each book, which I highly recommend checking out. Despite being known primarily for spooky music, Nox Arcana has also released two Christmas albums (with a touch of darkness). They also offer Christmas cards featuring Joseph Vargo’s amazing artwork on their official website! The Amazon.com preview for Monte Beauchamp’s The Devil in Design: The Krampus Postcards offers a wealth of vintage art depicting our old friend the Krampus. For those wanting a Merry Fishmas, I recommend this festive plush wreath featuring Cthulhu. Those of you who read my Man or Astro-Man? article might remember their robot-themed side project, Servotron. But what you might not know is that they did a Christmas-themed vinyl EP called There Is No Santa Claus! featuring cover art by Shag! Finally, here’s the Google Books preview for I’m Dreaming of a Fright Xmas by Alan-Bertaneisson Jones. It’s a highly informative and surprisingly lengthy (given the subject matter) tome devoted to Christmas-themed horror movies. I hope you enjoy it as much as I did!